Product Supplied By: CPUFX Inc.
As this new breed of overclockers becomes bigger and hungrier for the need for speed the methods of cooling down those hot CPU's are becoming more advanced. Watercooling has become one of the most effective and simpler ways of cooling down your system. There are many other methods but those are not as main stream as watercooling is becoming. Companies like CPUFX and Overclockers Hideout are providing simpler watercooling solutions with their line of watercooled cases. Also having these systems completely assembled and filled the average user can get sucked into this new method of cooling. The Nitro system is OCH's (Overclockers Hideout) latest addition to their line of watercooled cases and is one of the nicest looking. The entire system is enclosed in the Cooler Master ATC210 Case with blue front door and side window. 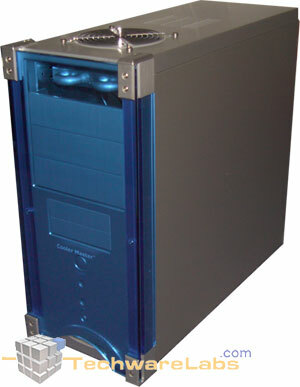 It offers a watercooling solution in a mid sized tower which would look nice in any environment. Of course being watercooled the entire system is very silent thanks to the Enermax adjustable fan on the radiator. Well I won't bore you with a longer introduction so lets head straight to the analysis. Above are the listed individual components in which are received with the purchase of the OCH Nitro system. Everything comes completely installed and filled. There is no assembly whatsoever required except the fact that the waterblock has to be installed onto your motherboard. OCH makes sure that all of the elbows and tubing are run in the correct fashion for a neat and tidy case. Every system they put together is designed to maximize the leftover room in the case and minimize the amount of clutter. Lets now have a closer look at each individual component and see what this watercooled case has to offer.